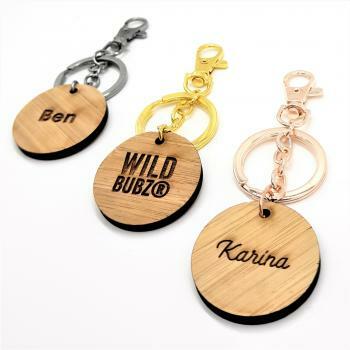 Personalise a custom bag tag | Keyring / key chain with any name. Perfect for bags, nappy bags, school bags, pencil cases + gifts of any occasion. Made from sustainably grown bamboo + metal keychain. Choose your keyring / keychain / bag tag colour + name by typing it into the text box. on pre made personalised key chains + components. Please contact us today for further information.